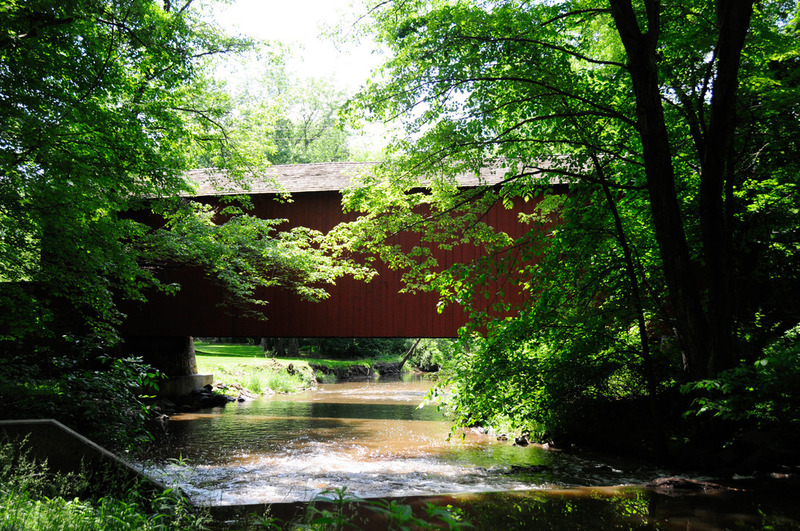 This is the Pine Valley Covered Bridge, which is located near New Britain. It is 81 feet long and was built in 1842 by David Sutton at a cost of $5553.50 of hemlock and pine timber. It spans Pine Run stream which may have been named for the white pine which were once abundant near the stream. Its the nearest one to my home in Bucks., located here. 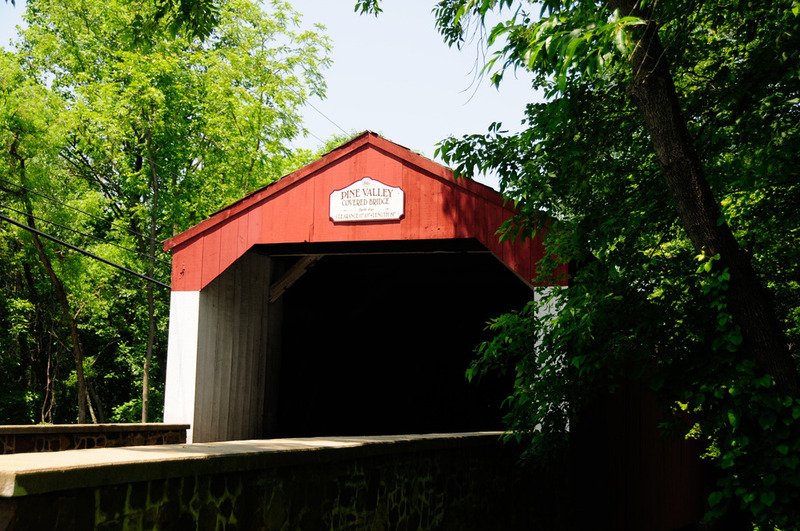 Pine Valley Covered Bridge is owned by Bucks County.This bridge is the oldest in the county. It is painted red with the white trim. This bridge was once repaired in 1917. Then it was closed again in the summer of 2006 to repair the deteriorating beams on the deck and other repairs to make the bridge safe for traffic. Pine Valley is still is able to sustain a high volume of traffic that uses it daily. It had only been reopened for just a few months prior to an accident in 2007. An oversized truck tried to goo through the old structure and tore off some of the roof and damaged the support beams under the bridge. The truck driver never stopped at the accident scene. Even if the truck driver didn’t feel the hit to the bridge, the truck would have damage done to it. 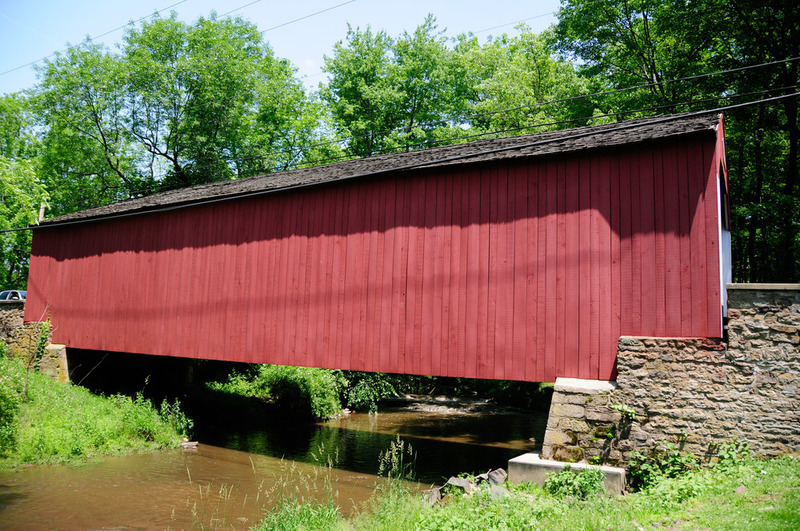 Each year the Central Bucks Bicycle Club hosts a covered bridges tour hitting many of the 11 remaining covered Bridges in Bucks County (at one time there were 36). On 2010, its on October 17. Research courtesy of Sunshine Red.